Modern has at times been described as a format hostile to Spike, the player demographic in search of winning at any cost. Indeed, “spiking” tournaments as players do in other constructed formats—by playing the best deck and understanding the mirror—isn’t a reliable path to success in Modern. Rather, this format rewards players for picking a couple strategies (ideally a pair of decks that operate very differently) and getting to know them inside-out. As for which decks to choose, I think the obvious answer’s also the best: your favorites! This article explains my own strategic preferences and applies those to my deck choices in Modern. Hopefully, witnessing the process will help those lost in the format establish their own playstyle priorities, and serve as a friendly wake-up call to players stagnating on a deck they understand well enough to prize with, but don’t enjoy enough to learn more deliberately. I’ll close things out with some practical tips for identifying preferences. 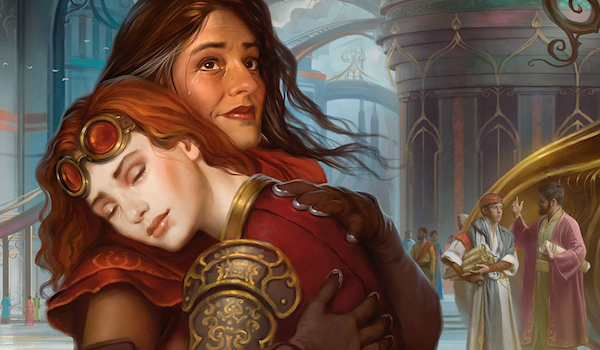 Love is a two-way street—beloved decks can’t be expected to deliver on all fronts. Enjoying a strategy is one thing, but taking the time to learn its strategic intricacies is critical to success. To do that, pilots must play attentively, with an open mind and an appetite for growth. That being said, I wouldn’t recommend mastering a deck you don’t like playing. Personal hangups about whatever strategy might get in the way down the road, causing you to burn out or become disinterested. Modern is chock-full of archetypes, decks, and individual cards, so there’s very little incentive to play anything but an exhilarating deck—and that deck is out there! Find it and cherish it. Aggressive. It bothers me to waste too many combat steps early in the game. We only get one per turn, and I intend on using those resources when possible. Aggressiveness loosely correlates with proactivity, but has more to do with establishing pressure quickly and putting opponents on the back-foot, even if the aggressive deck (i.e. Goblins) wins on the same turn (in this case, four) as an equally proactive, but not aggressive deck (i.e. KCI Combo). Adept at combat. Aggressive decks already attack plenty, so the emphasis here is on blocking. If I’m not vying for King of the Red Zone, I don’t feel like I’m playing Magic. Disruptive. Modern strategies that don’t seek to combo-kill opponents on turn three or four are required to run interaction. While I otherwise enjoy as proactive a playstyle as possible, I wouldn’t want to not interact at all. The two types of disruption I favor are cards that interrupt plays (i.e. cheap kill spells, permission) and cards that interact very efficiently with an opposing strategy (i.e. hosers, lock pieces). These three points already lock into aggro-control territory, which limits me to tempo or midrange decks. Reversible. Reversibility refers to an aggro-control deck’s ability to assume the role of its archetypical opposite when necessary—in other words, the ease with which a midrange deck can play like a tempo deck and vice-versa. I want control over the kinds of games I play. In-game consistent. Registering a pile of four-ofs isn’t enough for me; rather, I require ways to control which cards I see during a game. Risky. Specifically, I like decks that give me opportunities to take risky lines, not ones that force me into them. Flashy. I’d be lying if I said I didn’t like winning in style. This particular metric gives the decks I design extra points over existing ones. Seven points. Is that too much to ask of one deck? I don’t think so. After all, I’ve found decks that check all the boxes. And a deck doesn’t need to hit a home-run on every aspect for me to enjoy it—if my priorities were a tad more on the “winning” side than on the “fun” side, I’d happily sleeve up Affinity over Colorless Eldrazi Stompy when the metagame called for it. To illustrate some of the above points in action, consider this chart detailing proactivity among protect-the-queen strategies in Modern. Protect-the-queen is a playstyle that relies on sticking a highly impactful threat (i.e. Tarmogoyf) rather than flooding the board with bodies, and then defending that threat until it can win the game. In other words, they’re usually aggro-control decks packed with disruption. The following decks are sorted from fastest to slowest. Infect and UR Prowess are the most aggressive decks on the chart, as they goldfish kills faster than any other deck here. These decks pass my test on aggressive, in-game consistent, and risky, but fail the other metrics (okay, UR Prowess is kind of flashy). Most damning of all, they’re not disruptive—these pump-style strategies are aggro-combo decks, not aggro-control ones. The next-most aggressive deck here is Counter-Cat, capable of explosive Zoo-style openers and Growth-Bolt burn blitzes. I’ve tweaked this deck to meet my exact needs, so it passes every test with flying colors. The aspect I’d like to touch on here, since I haven’t mentioned it in my other articles on the deck, is riskiness. Each turn, Counter-Cat presents pilots with loads of choices to make, many of which revolve around mana constraints. Deciding whether to cantrip into needed pieces, hold up disruption, or tap out for threats to speed up the clock make piloting the deck a thrill. Traverse Shadow is one of the new-to-Modern midrange decks I alluded to above, and the only rock deck I can truly get behind. It’s not quite aggressive enough for my tastes, but it’s close, and the many optimization possibilities help with flashiness. Grixis Shadow, on the other hand, is too reactive for me. A full third of its creatures aren’t built for battle. Blech! On to Jeskai Delver: by no means a popular deck, but a helpful one for our purposes. I’ve messed around with Delver builds of all colors, including Jeskai. My beef with the wedge is its lackluster defense—nothing in these colors can block! The closest we’ve got is Young Pyromancer, which leaves much to be desired by further exposing us to damage-based sweepers and not actually deterring attacks. More aggressive builds of Jeskai featuring Steppe Lynx or Monastery Swiftspear offer no solution to this problem. Abzan and Jund are Tarmogoyf decks, so they’re great at combat. They’re also slow as heck. BGx Rock would enjoy a much better Tron matchup if it had access to a reliable, compact aggressive plan to up its reversibility, but it doesn’t. These decks also fail on riskiness and flashiness, as they’re safe and cliché—notably, they both fare okay on in-game consistency these days thanks to their respective adoption of Grim Flayer and Bloodbraid Elf. Looking at the chart overall, it’s no surprise that the decks in the middle of the proactivity spectrum are the ones with the highest reversibility. These decks can’t go under or over everybody, but they do get to choose which kind of game they play for the most part. Naturally, then, these thresh/xerox decks are the sort of threat-light aggro-control decks I gravitate to. I define midrange as an aggro-control archetype that tends to disrupt opponents first, then play out its threats (compare with tempo, an aggro-control archetype that plays out its threats first and then disrupts opponents). I used to think I didn’t like midrange decks, but I was wrong; in truth, I don’t mind disrupting opponents first. In order to have my aggressiveness needs met, though, a given midrange deck needs to follow that early disruption with lots of pressure, the likes of which few can muster outside of combo-style strategies. But combo goes out the window because I need to be blocking. A deck like this simply didn’t exist in Modern for most of the format’s lifespan, so I spent years mistakenly believing I didn’t like to play midrange at all. Then, one popped up. Colorless Eldrazi Stompy differs wildly from Counter-Cat: it’s more synergy-based; it’s far more streamlined; it’s creature-focused, rather than spell-focused; its disruption is mostly on noncreature permanents; it boasts zero colors to Counter-Cat’s four. And yet, this deck too checks all of my boxes. Mimic and Temple give us reversibility by bolstering our aggressive capabilities for a midrange deck; large Eldrazi bodies serve as Tarmogoyf analogues for red-zone dominance; Chalice of the Void compliments Dismember as hyper-efficient interaction; Zhalfirin Void compliments Serum Powder as in-game consistency. As for riskiness, the deck regularly mulls to four in search of the perfect opener, and Modern doesn’t get much flashier than exiling Scourge with Powder to start the game with more than seven cards. Just as Counter-Cat shares many strategic similarities with Traverse Shadow, Colorless Eldrazi Stompy also has a tiered analogue. In my eyes, that deck is Humans, a fish-style tempo deck with huge creatures, mana acceleration, and walking disruption. But unlike Traverse Shadow, Humans doesn’t appeal to me. It’s adept at combat and disruptive all right, and more aggressive than Colorless overall. But Humans isn’t so reversible, struggling against midrange decks heavy on removal spells that break up its synergies. Without searchers like Traverse the Ulvenwald or card selection cantrips, midrange-eating bullets in the sideboard aren’t a reliable solution to this problem. The deck also wants in-game consistency besides the anemic Horizon Canopy, making it prone to flooding, and earns a big fat “F” on riskiness and flashiness. I think Humans is an amazing Modern deck, and perhaps the most powerful option currently available. But I don’t think that’s a compelling reason for any ol’ Modern player to pick up the deck seriously. Without a love connection, most players will lack the patience necessary to become Humans experts. Playing with Colorless Eldrazi Stompy threw a lot of what I thought I knew about my tases for a loop. After years of clawing my way to close victories with Delver of Secrets, I was winning games unequivocally; I’d previously figured winning was only fun for me if I had to work hard for it. And here I was on a midrange deck rather than a tempo one; it wasn’t that I wanted to commit threats first after all, but that I just had to be more proactive than Modern’s old midrange decks. Eldrazi even forewent cantrips, cards I once considered necessary in decks I’d bring to real tournaments; it turned out any card selection method did the trick for me, even the unassuming (but familiarly named) Serum Powder. Critically, I wasn’t broadening my tastes by learning to like new things; I was refining them by realizing I liked things I had never tried, which brought me a more accurate understanding of what I liked about my original deck in the first place. I only learned these lessons about what I truly do and don’t enjoy by exposing myself to other playstyles, and I encourage anyone uncertain of their tastes to do the same. Practically, this task entails trying different decks and seeing how they feel. The more technical you make the task, the more useful it’s liable to be: take notes on your feelings during games, after plays, while you’re winning or losing; also note how you feel when the game ends, or ten minutes after. Pooling this data and reviewing notes might help the more distracted pinpoint aspects they like or dislike about individual decks, which brings them closer to a clear idea of their tastes. Modern players are extremely fortunate to play a format where succeeding with a favorite deck isn’t just possible, but the norm. Whether they take advantage of this aspect is up to them, but I suspect that decision has a profound effect on their win ratio. R&D first came up with player demographics to help with design. Spikes like to win, as mentioned; Timmies like casting big creatures; Johnnies like winning with flair, or using combination decks. But the average Modern player isn’t producing a game for millions of consumers, and personal taste reaches much deeper. Do you prefer your decks forgiving, or punishing? Relaxing, or demanding? Linear, or complex? Which aspects of each turn do you most enjoy? Which feelings do you hang onto after your games? Coming out with a better idea of where you stand will prove supremely helpful when it comes to serious deck selection in the future. There’s no accounting for taste. Let me know yours in the comments! Good discussion to have. The three decks I have gravitated most heaviy too are esper control, ubg tezzeret/whir, and tooth and nail. The problem? These decks lose a lot, and in painfully hopeless fashion when they do. There was a period where I thought tooth was only bad vs hatebears, and esper only bad vs tron, and tezz only bad in games two and three but the more I played the more I lost with each deck in succession. Perhaps that was just meta shifts getting hostile to my favourites or unusual good luck early on before crashing into reality, but putting more reps into these decks didnt seem to be making me better with them. So perhaps theres a missing component here – play what you love and master it, but if its not already tier one you’re still likely going to lose more than you win. Technically you can beat lots of things and thus spike an event, but on the whole tier decks are tier decks for a reason, and if you play something else you’re handicapping yourself no matter how much you love the deck. If winning some games is good enough, great. But if you want to win/compete consistently your deck has to pass some bar of competitiveness (tier two?) to really get there. I also cast my share of lotus cobra, bring to light, and glittering wish but no amount of game one fracturing gust or slaughter games or turn three sigardas could put me over 50 percent with the deck. So just saying theres something else in this modern stew than just master what you love and roll in the success. I agree with you. Like I said in the article, if I cared about winning more than I do now, I’d alternate between Eldrazi and Affinity depending on the metagame, and possibly add Traverse Shadow to the roster. But it’s more important to me to get more enjoyment out of my decks. That said, I do think your “bar of competitiveness” is a lot lower than what many players give it credit for. There are plenty of examples of Modern players who stick with a relatively fringe deck and experience constant success, especially (or, more readily accessibly) online—shocktroopa with Blue Tron; selfiesk with Mardu Pyromancer; h0lydiver with UR Prowess; etc. IMO if a deck experiences large-scale Modern success at least once and then stays relevant through the occasional 5-0, it’s a fine deck to pick up and master regardless of its overall share in the metagame (tier). Mardu Pyromancer doesn’t belong in the “fringe deck that one person does well with” category. I’m pretty sure it’s been putting up more results than Jund recently. Collins Mullen, the man who put the Humans deck on the map, recently described it as “like Jund except it’s actually good”. Well, it doesn’t belong there anymore! But before Gerry brought the deck to the big stage, selfiesk was the one dude playing it, and who went through enough tuning iterations to find the functioning shell that resembled the final product. I posit there are many such decks in Modern, and it takes passionate players to carve them out of the woodwork. For instance, I wouldn’t be surprised if UR Prowess has a higher win rate than its metagame shares currently speak to, especially in the hands of an expert. That’s a funny quote from Collins btw. While overall I think I agree with his sentiment, it’s a shame he used such vague language. It took me a while before finding my ideal decks. Tezzeret prison was among the first decks i tried in the format. I played the deck only because i loved tezzeret, agent of bolas and artifacts in general. I eventually realized that while i enjoyed putting pressure on my opponent with 5/5s or the threat of ulting tezz, playing the waiting game behind a bridge was really boring to me. On the other hand, i had tons of fun with blue steel (long before it came to light), satisfying my taste of being aggressive and play with synergistic pieces. I then tried various hatebears decks when i got my playset of aether vials, and enjoyed the synergistic aspects of the deck, but i hated that my little bears were powerless in combat. Then shadows over innistrad and eldritch moon happened and u/w spirits became my favorite deck. In addition to being a mix of synergy and tempo, It also felt kind of like hatebears in some ways, but everything flyes and has flash! Apparently my ideal deck did not exist before that. And now, after spending most of modern’s early years brewing janky stuff (i tried a lot of other things in that period), i now have a hard time experimenting with other things than my u/w vial spirit deck and my blue steel deck (which got miles better with kaladesh block). since i enjoy playing them so much! I remember you playing each of those decks, and used to describe you to people as “The Tezz Guy” and then “The Blue Artifacts Guy” and then “The Hatebears Guy…” glad you finally found something that really resonates with you. Now, you get to enjoy the benefits of intimate knowledge and expert tuning! But I love complex decks that can dance circles around their opponent while ideally almost never blocking or being blocked. I love bouncing, flash, tapping, remanding, and shenanigans. I hate playing stat monsters like eldrazi and I hate playing planeswalkers. I love reversibility, flash, and open ended gameplay lines. Who knows if they care, but I do! Want to share a list with us? You’re gonna have to trust me when I say it plays much better than it looks. Midrange and control are 80-20 matchups (except mardu which is more like 50-50, pyromancer is hard to deal with), combo is like 60-40. Humans I’m still sitting at 100% win rate with a 4-0 so far without dropping a single game. Basically the deck finds what’s good in the matchup, then doubles, triples, quadruples that aspect of the deck. Need lifegain? Fink’s, bellower a Fink’s, clone a finished, bring it back with witness. Plus the Ewitness cackling counterpart combo is nuttttssss. I know it looks goofy on paper but in practice it’s really formidable. Turn 2 cryptic command is no joke. Ha, that’s so fun! It does look interaction-light to me for how slow the clock is, but if you’re winning, you’re winning. Dismember/Gut Shot are options for Pyromancer and friends, even in the sideboard. Before Modern was announced, I was buying up foil playsets of singles in UG that tickled me to build casual decks with… Familiar’s Ruse, Ninja of the Deep Hours, Kitchen Finks, Spellstutter Sprite, Coiling Oracle all among them. So I can relate to loving goofy value plays in UG! Yeah it is interaction light but it’s interaction is very potent. Eternal cryptic locks are the cleanest answer to creatures. It’s clock is also much much faster than it looks because the arbor elf utopia sprawl puts me so far ahead on Mana (also oracle for semi ramp) that alot of the time I kill them around turn 6-7. It only really struggles with aggro where blocking is not an option. Infect, affinity elves , and Merfolk are the only truly bad matchups, and are nearly unwinnable. Meanwhile burn, zoo, taxes and humans are hard to lose. As of yet I haven’t found a very clean solution. Dismember will almost definitely be replacing one sideboard slot before Vegas. But yeah. Goofy value is super fun. I’d say give it a few plays but it’s definitely not the playstyle you’re into haha. Proactive: I knew I wanted to be the one trying to end the game, not the one trying to stabilize. Metagame-resistant: I didn’t want a deck that thrived off of tuning for a specific metagame, I wanted a deck that would be 80% at full strength no matter what metagame I went into (outside of a metagame filled with decks hostile to mine). Redundant/Consistent: I knew I wanted a pile of four-ofs, not a deck where I was hedging my bets and hoping I could select the cards I needed through draw/filtering. Hard to ban out: I didn’t want my whole deck to rest on a single card, so that if it got too strong it would be easily banned from the format by Wizards. A tight 60/75: I wanted a deck that was already at optimal capacity, and that few future cards could be printed that would be auto-includes in the deck. Consistently tier one or two: I wanted a deck that was always decently powerful, something where it would rarely be a bad idea to play it. Fair or “fair” and ideally not blue-based: I really don’t care for combo decks, and wanted to feel like I was playing traditional Magic. I also just prefer not to play blue. My favorite way of playing Magic is to be the police force against decks trying to do ridiculous things. All of these requirements together put me on Burn, the deck I’ve played pretty much solely ever since I got into the format. No regrets. My friend and I read through your post slowly and tried to guess what deck you were on (we succeeded)! Thanks for the comment. A really enjoyable article to read and one I can certainly relate to. When I went back to MTG in 2013 after a 8 years break, I chose to focus almost exclusively on Modern. I remember, I was looking at what was performing at the time and one deck caught my eyes. Jund! It had everything I thought I liked in the game: a huge beater, answers, card draw with bob, planewalkers, etc. Took me a couple years of playing brews, Affinity sometimes before I was finally able to gather everything up and when I did… Something didn’t clicked. I somewhat improved my win-rate sure but I wasn’t having fun. That didn’t make a lot of sense to me, considering how excited I was and it took me a while to figure out the issue (a mixed bag of not liking: discard spells, the slowness, being in topdeck mode). And that’s about when something really cool happened… You posted your very first article here on Monkey Grow! Gave it a try for a change and just fell in love with it. There’s one word that sums it up, I think you use it regularly in your articles. It’s *thrilling* to play. But my win rate crashed. That updated Counter-Cat build looks cool though and maybe you’re right, maybe the “bar of competitiveness” isn’t as high as people think and I should focus on what I love. Jeremy that is very similar to my experience with Modern (different decks but same concept). I play good decks and win but don’t enjoy it, I play bad decks and lose and don’t enjoy it. Why am I playing this game again? My “sweet spot” is probably playing bad decks that win, which is just not going to happen consistently – but every so often I go on a string of wins with some tier 3 pile and think “maybe this is it”, go on a run for a couple weeks and then start getting disillusioned again when the losses start piling up. I keep thinking I’m no the next humans or next hollow one or next mardu pyromancer, but mostly I’m just on the next allies. Thanks for sharing, Jeremy. At the end of the day, Magic is a game, and for most, games exist to have fun! So whether you opt for the safer, winninger deck or the more thrilling rogue pile, make sure you’re enjoying your hours spent playing. Another aspect I’ve been thinking about a lot lately is learning, something I love to do re: Magic and get to do a lot of when I do lose. Free-win games handed to me by a fast Chalice of course offer less introspection and growth. So that might be something to consider, too! Hi Jordan! Just put together the counter cat list from this article and have been having a blast with it. I’m a bit lost on how to sideboard effectively with it though. Do you have an overall philosophy on what kinds of cards come in / out vs what archetypes? Thanks a ton man love your work! Sideboarding is one of the trickiest things about Counter-Cat! Be sure to check out my articles on the deck here by clicking on the tag at the bottom of this article, as well as the thread I run on MTGSalvation. A lot of good info has been published already.